Three perfect loaves of almost no knead bread. My first adult baking task was completed on the advice from a friend who suggested I could turn a great pie with off-the-shelf supermarket ingredients like frozen pie dough and minute tapioca, and he was right. “Easy as Pie” was true. Over the decade and half since, I have occasionally challenged myself to be a better baker and nothing is more challenging (or more rewarding) than making good bread. Of course, making bread is an art people dedicate to their life to, but it starts with a good recipe and good ingredients. The recipe from Cook’s Illustrated (via the NY Times ‘where it was titled “No Knead Bread”) is so good, so nearly flawless, that it is continually reprinted again and again, cited everywhere and all over the Interwebz is the go-to bread recipe for people who want something more interesting than bread machine bread but less complicated than San Francisco sour dough bread starter in a jar. It has just enough steps to ward off the casual bread baker and is probably a wee too simple for the artisan. However, it’s perfect for me, because I know how to make them efficiently and good, and I always share. This recipe has five ingredients, so MAKE THEM GOOD. In a rare commitment to quality, I am actually listing the brands I use, because I do think they make a difference. Perhaps not much, but enough. I use a 6-qt Le Cruset cast-iron dutch oven, which is darkened from bread baking. 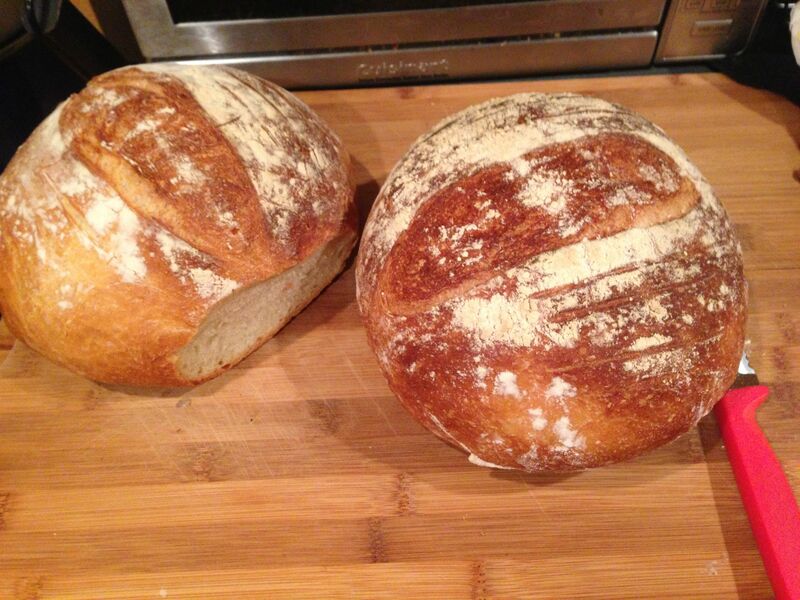 I make two loaves at a time because, honestly, I didn’t want to waste the beer, and the bread never ever gets thrown away, it always gets eaten. (And the beer is consumed too, but there’s only a little left if you make two loaves). Whisk flour, yeast, and salt in large bowl. Measure out liquid ingredients. Ensure you use room temperature water– the only thing you really can mess up is by killing your yeast by pour hot water or inhibiting it by pouring water that’s too cold on it. To avoid this issue, I pour the vinegar and beer on the dry ingredients first, allowing the mixture to get bubbly, and then add the water and mix. Mix with a rubber spatula just until mixed (you’ll have the ‘shaggy ball’). Cover with saran wrap and leave for at least 8 hours. Lay a long sheet of parchment paper inside a shallow work bowl and spray with PAM. Transfer dough to lightly floured work surface and knead a dozen times. Shape dough into ball by pulling edges into middle. Transfer dough, seam-side down, back to bowl. Cover loosely with plastic wrap and let rise at room temperature until doubled in size. This is a minimum of two hours, but longer can be better, depending on the temperature of your house at the time of baking. Place your empty dutch oven, in the oven at 500 degrees for 30 minutes. Lightly flour top of dough and, using razor blade or sharp knife, make one long, slit along top of dough. Carefully remove pot from oven and remove lid. Pick up dough by lifting parchment overhang and lower into pot (let any excess parchment hang over pot edge). Cover pot and place in oven. Remove lid and continue to bake until loaf is deep brown and instant-read thermometer inserted into center registers 210 degrees, 25 minutes. (I have found that you don’t actually have to take its temperature, it’s reliably this temperature unless something is very wrong). Cool as long as you can, but you might have to cut into it and slather it with salted butter and enjoy. So simple, so delicious, I always make two at a clip. Posted in Sides & Salads and tagged better than bread baker bread, bread, new york times no knead bread, no knead bread, perfect bread on March 16, 2016 by Robert Deutsch.